Bonnie came to sleep on our porch last February. We live in Texas where it seldom gets cold enough to freeze. When it does we cover our plants to protect them. We had a cold snap and following the freeze it rained and the sheets I had used to cover the plants got wet. I drug them on the covered patio to dry and they remained there far longer than necessary. It was a good thing. One evening my husband looked out and saw a small black dog curled up on the now dry sheets. She had pushed them into a pile and was bedded down. I was thrilled as I had been trying for months to convince him we needed a dog. However, our new dog was not interested in anything but food and a place to sleep. There was no getting near her. Poor little thing was terrified of people. I put out food morning and evening and it disappeared. She didn’t object to us watching her eat or sleep through the windows but just touch the door and she was long gone. This little stray took over the neighborhood. She was so tiny fences didn’t slow her down. She played with the big dogs, ate their food and was fed by those who did not have a dog, but no one could catch her I let everyone know we wanted her and they agreed to stop feeding her so she would bond with us. Late one afternoon, with the goal of developing some trust, I put out food and sat absolutely still waiting for her to come. She showed up, took one bite, saw me and retreated. She would start for the food, then look at me and back up. Finally she glowered at me, growled and ran across the yard barking. It was the first time we had heard her make a sound. She let me know just how angry she was with my interrupting her dinner and intruding on her sleeping spot. She didn’t come back until the wee hours of the morning. It was a harbinger of things to come. Finally a young neighbor lured Bonnie with food and managed to catch her. She called, I came with a carrier and Bonnie spent a couple of days at the vet getting shots, a bath and starting treatment for puppy mange. The vet figured she was about six months old—still a puppy. I brought her home expecting it to take at least a week to win her over but was I surprised! Within a few minutes she was in my lap and the relationship has done nothing but deepen. 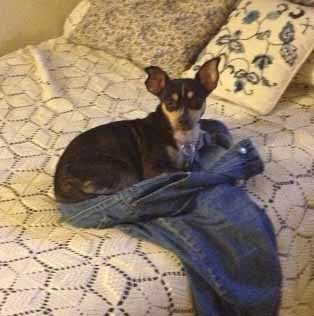 Until she came home that day we had never seen her tail anywhere but between her legs or straight out behind her. We rejoiced to see the tail come up and now it is in an almost constant wagging state. But there was still a problem. My husband wanted to be included in all this loving, but it didn’t happen. It took weeks before she would even take food from his hand. He has always had a way with animals and her attitude was a real blow. He loved her, but she continued to reject him. Only when I left for ten days to visit my brother did a breakthrough come and then only after a week with a broken-hearted dog. On the eighth day she finally began to warm, and by the time I got home, she was in his lap. Bonnie is now somewhere close to a year old, a bit larger as she is physically mature, smart, strong willed and stubborn. 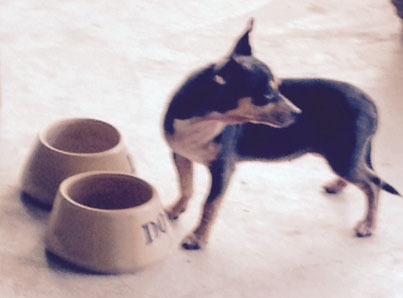 We have decided that she is mostly Min-Pin and Dachshund and she has traits of both breeds. Her personality continues to emerge as she begins to heal from the hurt that happened early in her life. I don’t know about you, but the Lord uses all sorts of things to speak to me and Bonnie has been one of them. As I thought about the battle we had to get her to trust, it reminded me of our difficulty in trusting God. Here she was, a tiny puppy trying to take care of herself, filled with fear, obviously unhappy (remember the tail) but refusing to accept help and going it on her own until she was caught. How was she caught, by something she really wanted—food. How does He catch us—same way, though the thing wanted differs. The end result for her was a relationship of love with me. For us it is a relationship with Him. At first it was all fun for Bonnie, nothing required but to see her happy as she showered me with kisses, played with her toys and showed her delight with a wagging tail. Her response reminds me of my first months in the Kingdom. What a time of joy and discovery. My husband was the one who was left out even though he made a valiant effort to win Bonnie’s trust. It took a hard time for her to give in and accept the love being offered. Her experience with men must have been like many have with their fathers. Our spiritual life is not complete without the Father. He will do what’s necessary to draw us to Him though, like Bonnie, it may not seem like love to us until we get through it. Bonnie is an escape artist who had learned to quickly spot any places she could squeeze through. One tiny hole in the fence and off she would go. We fixed the old fence and gave plenty of space to run but with safe boundaries—He does that for us. She still spends time looking longingly out the window or through the fence at life outside our loving care. It looks like such fun and certainly not dangerous. Been tempted lately? Bonnie learned the play part of life all by herself. She is really good at it but the discipline and responsibility facets could use some work. Sound familiar? We have tried since Bonnie came to housebreak her. She agrees only half way—outside is good only if convenient. Since she always accompanies us on our bathroom trips, I think she has made the connection and claimed a spot in the house as her own. It is on one throw rug in front of a bathroom door. We love Bonnie and are willing to put up with her disobedient act while we work to convince her otherwise. Damage to the carpet is prevented by putting training pads under the throw rug and keeping things clean with two extra rugs that go down as needed. She is a dog not a human—we are humans, not God, yet we far too often with the best of intentions usurp territory that is His alone. The Lord has waited for me to become obedient on many issues, how about you? Bonnie still has a long way to go as her obedience training proceeds. Coming when called, even when she doesn’t want to, is next on the list. This may turn into the ”Parables” rather than just the “Parable” of Bonnie. God still has a lot for me to learn. She is a delight. The thing is the way the Lord uses what comes into our lives to speak to us. there is at least another article already. The dog is a walking lesson. What a delightful and applicable parable, Pat! I’m so glad Abba sent Bonnie to your loving home and you two trusting caretakers. Loved the connections of truth.